I do believe this was written by Stephanie Myer. Possibly a prequel to the Twilight series? How can you expect this guy to understand the word "Frivolous"? this guy will probably be paid in cookies when he grows up. I think this kid made PERFECT sence. Not money is not money? wtf-?! Since When?!!?! The BRC (Broken Record Collective)-creating WTF since 1923. HOLY CRAP. i write thing like this all the time! I just figured it was my own unique style of awful writing for entertainment. awesome! It almost looks like what is written is in a different language, so maybe this was an English class in another country, and that's why it doesn't make sense. This is actually better than Twilight. Am I the only one who noticed this kid has three parents? Why isn't anyone asking why he has two mothers?! I will take their money: "all your base now belongs to us"
Such innocence in these children. Let's try to make life easier and less complicated to our kids. 2 mothers and 1 father??? Haven't explained biological and step moms to this kid? sounds like the same kid to write the "El Nino" paper. its got the same repetitiveness and circular thinking. i liked the El Nino one better, though. this reminds me of that one kid i kicked in the balls for talking like mojo jojo. Talk about stating the bleedin' obvious! I believe this was written by Mr. T.
did anyone realized that the first coments has "666" thumbs up? 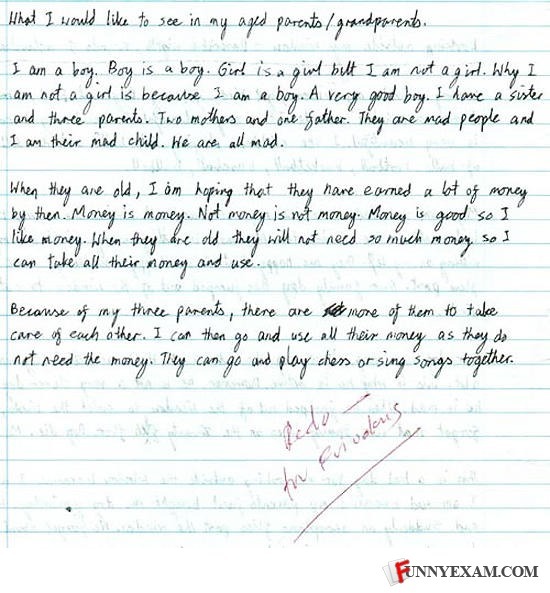 if he is a boy then how can he write so neat. but his grammar stinks. Parmenides said that long ago: the being is and can only be. The non-being is not and can't ever be. My first response as the teacher would have been..."Glad your not my child"
It feels like I'm reading "As I Lay Dying" by William Fuckyou. This isn't even funny, this one speaks of someone with a serious mental problem that appears to be overlooked. Very similar to asbergers syndrome. Stephenie Meyer does NOT write that way. Just saying. He is a good boy. a good boy that robs his elderly parents while they play chess. He has 2 moms and 1 dad...? No wonder they are all mad! I don't think this kid understands the concept of taking money from parents. I lol'd. Nice Alice in Wonderland reference - this kid knows classic literature. How did this person manage to operate a pen on their own? They are mad people and I am their mad child. We are all mad. HA HA HA!! its all because he has two moms. sad, isn't it? funny, but sad. like poking a dead man with a stick. I'm pretty sure this student has a personality disorder. Seems rather advanced hand writing for someone that has learned to speak like a child. I'm suspicious. What the hell did the teacher write? What is Godzilla's favorite sport? Nothing, Godzilla is a fictional character. Man: GET IN THE VAN!